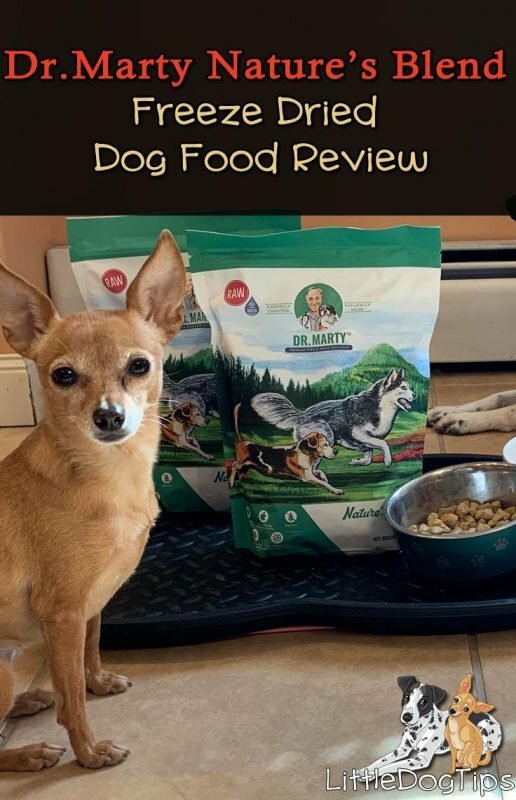 Matilda and Cow were thrilled to try Dr. Marty™ Nature’s Blend dog food – and I’m pretty excited to introduce a premium food option that meets the high standards of our personal food rotation. If you’re looking to upgrade your dog’s diet, you and your dog are going to love Nature’s Blend too. Sometimes I hear about dogs who turn their nose up at “healthy food,” and their owners have to compromise and offer them a subpar brand just to get them to eat. Freeze-dried foods like Nature’s Blend are an excellent solution to this – dogs are attracted to the flavors released when you add warm water. You can even add freeze-dried food to your dog’s existing diet to get her excited about her meals. If you’ve ever tried freeze-dried liver treats (most dogs go nuts for those!) this food has a very similar, meaty smell that’s mild to us, but wildly delicious to most dogs. 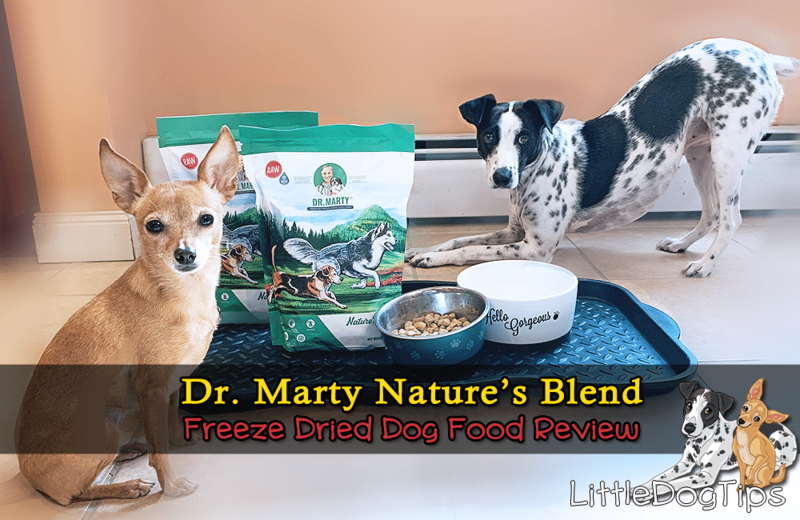 What Exactly IS Dr. Marty Nature’s Blend Freeze-Dried Food? 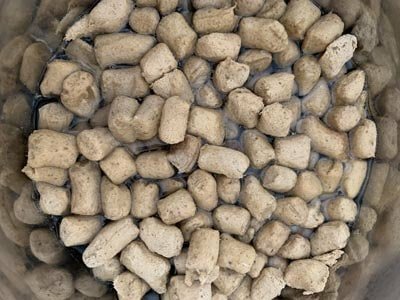 Nature’s Blend consists of freeze-dried pellets that you rehydrate with warm water before serving. Just like astronaut food, it is lightweight and condensed, all of the moisture removed to make it easy to transport and store without freezing or refrigeration. Dr. Marty Nature’s Blend is described as “raw,” on the packaging and on their website. As a raw feeder, this gave me pause at first. Is freeze-dried food really raw? The more I learned about their freeze-drying process, the more I understood why you could call it raw. Nature’s Blend starts with raw turkey, beef, salmon, duck, and other whole-food nutrient sources like sweet potatoes, eggs, carrots, cranberries and pumpkin seeds. Ingredients: Turkey, Beef, Salmon, Duck, Flax, Beef Liver, Turkey Hearts, Turkey Liver, Sweet Potato, Eggs, Pea Flour, Carrots, Apples, Blueberries, Cranberries, Pumpkin Seeds, Spinach, Ginger, Salt, Mixed Tocopherols. The food is then frozen, the pressure is dropped, and the ice is removed through sublimation – all of the moisture goes from solid to gas, skipping the liquid state. Through the entire process, the food never reaches 30 degrees Fahrenheit. In the end, you get these condensed pellets that expand when you add water. In just 3-5 minutes, your dog’s meal is ready to eat. High temperatures used to process most dogs foods kill off naturally occurring, digestion-aiding enzymes and nutrients. That’s why raw feeders like me do not cook during food prep. Freeze drying is another way to keep those enzymes and nutrients intact. Speaking of nutrients, you’ll notice from the ingredient panel that there are no artificial sources vitamins or minerals. Nature’s Blend is complete and balanced and meets AAFCO standards by only including foods that contribute to your dog’s daily nutritional needs. There are absolutely no ingredients added as fillers. 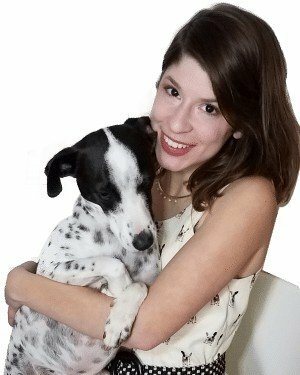 So, your dog is getting most of the benefits of a raw diet, without the freezing and thawing. Once you add water, the food “comes back to life,” and it’s essentially raw. Some of the live bacteria and digestion-aiding enzymes from the meat do survive the freeze-drying process, and they are revived when you prepare the food. This is why you need to treat freeze-dried food as raw when it’s rehydrated, and why it’s so similar to fresh foods in benefits, yet so much more convenient. Dr. Marty Nature’s Blend contains no chicken or chicken fat. Chicken is one of the most common food intolerances affecting dogs like my Cow, so it’s great when we’re able to find a food with limited ingredients and absolutely no chicken. It’s ideal to use multiple protein sources in your dog’s diet to make sure she’s getting a range of nutritional benefits. Nature’s Blend contains Turkey, beef, duck and salmon, so you don’t have to worry about rotating proteins. I’m also happy that it comes in pellet form. Powdery, pulverized food mixes tend to turn into a soggy sludge that my dogs won’t touch. 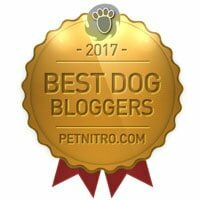 Best of all, Dr. Marty sponsors Freedom Service Dogs Of America, an organization that rescues dogs from shelters and trains them to be service dogs for people of all ages, including children and veterans with disabilities. Talk about a second chance! If you’re feeding a raw diet, but you sometimes run out of food or forget to thaw, you can keep Nature’s Blend in your cabinet for a long time – as long as it is stored properly and not exposed to moisture. Then, you can whip up a meal in five minutes. If you’re feeding kibble, and do not have the freeze space or budget for raw or can’t feed an exclusively freeze-dried diet, replacing even one meal per week can make a difference in your dog’s longevity. You can also crush it and mix it into your dog’s kibble to help pique her appetite. You can even use this food as treats. It can be fed dry, right out of the bag. Nature’s Blend is appropriate for dogs of all ages, sizes and breeds. You should ask your veterinarian before making dietary changes if your dog has a chronic health condition. Try Dr. Marty Nature’s Blend Freeze-Dried Food Today! Get Dr. Marty’s Amazing New Customer Offer! Dr. Marty stands behind their food with a 90-day, no-questions-asked money-back guarantee. Your dog is probably going to love this food and thrive on it – but if she doesn’t, there’s no risk in giving it a try. Sounds like a great food! I’m not familiar with this brand, it’s not available where I live, but when I brought my dog to Canada with me this summer I was in search of a new food since his is not sold there. I found a canned brand I liked, but also discovered freeze dried which I crumbled on top. He absolutely loved it!! It looks like an interesting food! I feed raw but do like to keep up with what healthy commercial foods are available for times when I need a back up food. This one would probably work well for my younger dog, as long as he’d eat it (he’s super picky), but sadly my older boy can’t eat poultry of any kind or eggs. I have never heard about that brand and it looks like a food I should actually keep in my emergency bag as it needs just water. I am going to check more into it so thanks for sharing. I have always wondered about freeze drying raw food and how it works and is it still raw. Thanks for explaining so well! This food sounds great. Love that it includes salmon, which is Ruby’s favorite! Freeze dried is the best for travel. It’s light weighted unlike other dog food you can actually fly with a sealed bag of it. We don’t use this brand (we use a Canadiana product) but I may look into it! Always good to have options. I prefer the patty to the pellets personally though. And I look for bone and high organ meat content since I use it as a supplement to fresh meat. I’ve been hearing a lot about Dr. Marty’s food lately. One of my co-workers even told me about it, and she wants to try it with her pets. I’m always on the lookout for healthy food, so maybe I’ll ask her for a little to see if my girls like it. This sounds like a great food. Thank you for clarifying what freeze-dried food really is. I’ve given Buffy freeze-dried treats and she loves them. I really like that this company supports Freedom Service Dogs. Freeze dried raw food is so great – and convenient, we totally get it! We saw Dr. Marty’s in the pet food store this weekend – so will definitely pick it up next time we run out.This one sounds very nutritious and in a flavor that the pup’s will enjoy! Freeze dried food is something our cats are oddly wary off. No idea what because the foods that are dried this way are usually the top quality and super tasty brands. I will look out for it here. I have never heard of Dr Marty Nature’s Blend! We feed a primarily raw diet and often sub in freeze dried raw as well. I love the convenience of freeze dried food, especially when camping and traveling. So much easier than toting around a big cooler and worrying about keeping it frozen. I’ll definitely check this brand out. I do love the ingredients list. Seems there is mostly protein and a very moderate amount of carbs. Awesome. I’ve given Truffle and Brulee freeze-dried treats and they love them, especially chicken and salmon. I haven’t had as much luck with the freeze-dried pellets that are hydrated. It is always good to find food for your dogs that you feel good about feeding them! This seems like it would a great food to have on hand when you travel or have to evacuate since it won’t weigh as much as regular food. My dogs tried another brand of dehydrated food, but it was very mushy. They liked it well enough, but Nelly’s beard was always getting food in it. Usually I never comment on blogs but your article is so convincing & just amazing that persuade me to commenting..
That looks like a great food option. Freeze dried makes raw so convenient when traveling. And I always have to have something for those days when I forget to thaw the meat in time to make dinner. This sounds very good! Sometimes a couple of my Huskies can be picky eaters, and I’m thinking this would be a great, enticing topper! Thanks for the great review. I found a canned brand I liked, but also discovered freeze dried which I crumbled on top. He absolutely loved it!! I haven’t had as much luck with the freeze-dried pellets that are hydrated.Thanks for the reviws.